Norwegian Cruise Line: View ships, destinations they visit and activities! 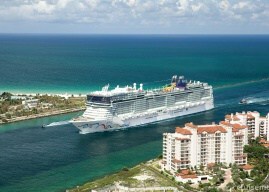 Norwegian Cruise Line is a popular cruise line based in the United States. It is best known for its Freestyle Cruising concept – this means there are no set times or seating arrangements for meals, nor is formal attire required – unlike the majority of cruise lines. Norwegian Cruise Line was actually founded by two people; one of which was Ted Arison, who left shortly after it was founded and went on to create Carnival Cruise Line, his son (Micky Arison) is now the CEO of that company. The first ship Norwegian Cruise Line operated was a simple 8,666 GRT cruise ship/car ferry, called the Sunward. This operated only one route between Southampton and Gibraltar. Not long after that the cruise line acquired additional ships and operated them purely in the Caribbean region. Norwegian Cruise Line pioneered many firsts in the cruise industry which included the first cruise-fly program – combining cruises with low-cost return flights to destinations and they were the first cruise line to develop specific-cruise ports in the Caribbean. Recent firsts include family suites with a private jacuzzi on the balcony area and also new waterfront decks – where cafes and restaurants open to the outside deck allowing you to sit next to the sea whilst you dine. Currently, they have 14 ships in their fleet – giving them a total passenger capacity of 37,690. They currently operate around 8% of the worldwide cruise market. Norwegian Cruise Line’s ships are distinct in having very brightly coloured hulls. Artwork by premier marine life artist Wyland has featured on the Norwegian Bliss for example. The ship has a mother humpback whale and her calf, amongst other sea-life painted on the hull and represents the conservation efforts in Alaska, where the ship is her homeport. Perfect for families and children. Lots of dining options and activities.